Books for Less is having a Great Warehouse Sale! 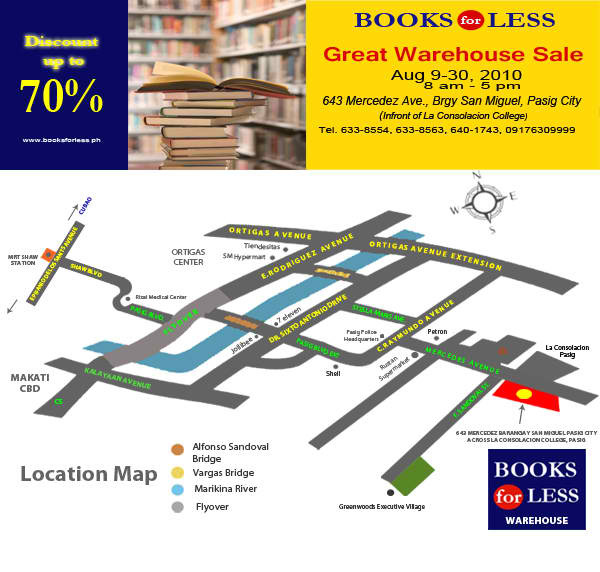 You heard it right, fellow book hunters and bibliogeeks, Books for Less (already a discounted bookstore) is having a Warehouse Sale (70 percent off its usual dirt-cheap prices) from August 9-30, 2010, in front of La Consolacion College in Pasig City. If I were only in the Philippines right now, I’d end up with boxes of books for certain. You can NOT afford to miss this huge sale. I bought my first postmodern picture book in their MOA branch and I have not been the same ever since. People from Manila who are planning on going, please make me cringe with envy by posting your book purchases.